It’s a beautiful blue Sunday morning in Palo Alto. As you stroll through the farmers market along sunny California Ave., your eyes wander over the long strip of booths colored by Cara Cara oranges, crisp Gala apples, fluffy sweet brioche, and fresh bouquets of peachy tulips. 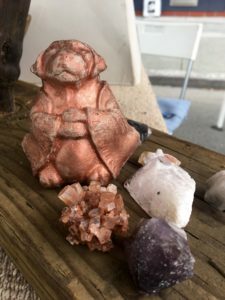 At the very corner, you spot an extraordinary booth — a kaleidoscopic array of magical amethyst gemstones, turquoise bracelets and a gold sculpture of a meditating dog channeling its inner spirit, all accompanied by a woman with the most welcoming smile of the day. 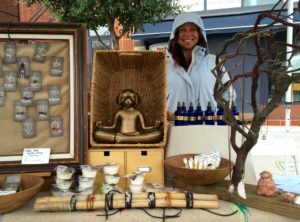 Meet Lisa Marie Haley, a devoted reiki master and vibrant local artisan who runs her own booth at our local farmers market every single Sunday. Just like many of us, Lisa thinks Stanford is genuinely a great place to be. She went to school here to pursue a B.A. in psychology before coterming in sociology. She began to pursue her Ph.D. in sociology soon after but was instead called to open up a yoga studio, which she ran for eight years until it was acquired by YogaWorks. After experiencing what it was like to run her own yoga studio, Lisa was intrigued by “getting people to get in touch with their intuition and their ability to heal” — this was the start of her energy work. 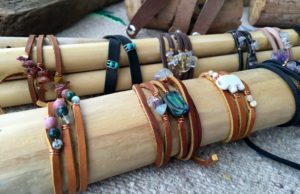 She currently works at the farmers market every Sunday, making and distilling her own essential oils and handcrafted jewelry and offering people healing tools and energy medicine through chakra-based objects, such as bracelets, gemstones, candles and oil sprays. The farmers market along California Ave. is run by Urban Village; it’s a vibrant and strong community of artisans and farmers who are truly passionate about what they do. 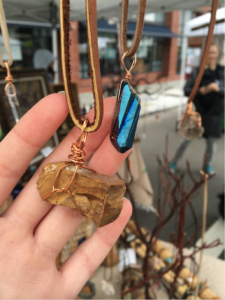 She wholeheartedly believes that the value is all about sharing that invaluable connection with those who come to shop locally and support the farmers market. For Lisa, being an artisan means sharing a part of herself with the world. It’s about hand-crafting something herself — the opposite of a high-volume manufactured deal. For many dedicated artisans like Lisa, it gives their life so much meaning when they have the chance to share an honest connection with the people they meet along the way. Whether it’s through the work she has created with her own hands or even through simple conversation, Lisa hopes to brighten people’s days and make a lasting positive impact on the environment around her. This priceless connection from human being to another human being is just one of the many reasons we should support artisans and farmers who happily run our local market. If you would like to talk to Lisa, you can stop by the farmers market any Sunday or you can reach her at contactapothecary@gmail.com or 530-494-9803. She offers free meditation at www.bodyandsoulapothecary.com as well, so don’t miss out!